In response to a reader’s question about which belt is appropriate to which occasion. So which belt to choose and why? Obviously you need at least two if you wear more than just black, cordovan or brown shoes, for your dress belt must match your shoes in finish and colour. I would also say that the hardware should match all other metal you wear, but that’s going a bit too far in my opinion, as long as the buckle is discreet. I wear a gold wedding band, sometimes a gold signet and stainless steel watch, so there’s that issue. Another issue is actually finding a quality belt in which to invest. Most belts are made of two rather thin strips of leather that are glued together over a plastic lining. Was it “glued” or “plastic” that made you wince? In terms of elegance, the general rules apply. Thin, as always, is in. My belts are roughly one inch wide. Wider belts, although utilitarian, especially if there are to be holsters for various devices suspended from them, are to be avoided. There was somewhat of a fad for them as they matched those square-toed Frankenstein shoes that were popular for some reason. And even if you are constantly in business casual dress, they just strike the wrong note. There are a couple of good brands of belt out there — or at least there used to be. Coach and Trafalgar spring to mind. I have owned two Coach belts in my “adult” life. The first saw me through high school and college. It was only that dreaded day when my waistline passed the 32″ mark that I was forced to buy my second, around 1990. I chose black for both. My favourite brown belt is a glazed crocodile strap by Ralph Lauren that I got at a deep discount. With it, I wear a detachable, engine turned silver slide buckle engraved with my initials. I love the colourful ones that ADG has Flusser’s people make up for him. Casual belts run the gamut from woven leather to surcingle, ribbon and cotton webbing. You can get away with a thicker belt if you are wearing chunkier shoes or boots. Casual belts are suitable for jeans and khakis. For the most fun you’ll have reading about belts head over to The Trad’s spot for Fridays’ belts and a belt posts. Tintin has a way. This entry was posted in Elegantology and tagged Alligator straps, belts, Coach, Crocodile Straps, Flusser, Maxminimus, Ralph Lauren, Rider Boots, The Trad, Trafalgar. Bookmark the permalink. Great subject for a post! I agree that more attention needs to be given to this accessory. I find that most men wear belts with buckles that are too thick, or bulky, giving an unrefined look. The most difficult thing is to find a buckle that is neither too bulky nor too diminutive. The buckle of the Coach belt you’ve shown, too my eye, is just the perfect proportion to be elegant. 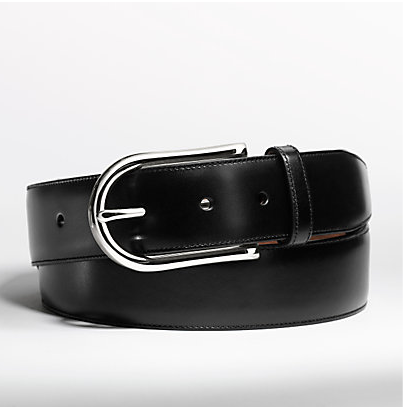 One annoying thing I find about shopping for men’s belts is the lack of colour choice. You can have black, black, brown, or black. I find this most noticeable when looking for leather in beige, camel, tans, etc. to wear with summer trousers. With regard to cow leather, I was told European is better because they use dairy cows which live several years and are grass fed and don’t have weak, fatty hides as opposed to beef cows which are fed grain and live a much shorter life to be served as tender steaks. Their hides have some of the “marbling” that makes them have weaknesses and are not nearly as durable. I’ve dissected the products of Gucci and found them lacking in quality material and have noted questionable construction (your glue and plastic comes to mind!). When in doubt, go Coach, Ghurka, Hermès, Trafalgar, or even some that I’ve found fairly recently at Eddie Bauer that were made in England at a most reasonable price. And for summer, don’t forget the silk necktie as a belt…it is simple, charming in a Brideshead Revisited sort of way, and always brings compliments. And you can re-cycle that otherwise unusable tie with the small vichyssoise stain that won’t be seen when it is around your waist! SwF, agrees about the tie, I wear one a lot. It would be better if I had a silver D-ring to use as a buckle though. Perhaps not as distinctive, but also less flamboyant. Have you seen these incredible belt buckles – Christopher Ross….fox heads, frogs, hares, etc, they are grand and would be a nice fashion statement for tightening the belt. I’ll look into them Mrs. PvE! Most wonderful belts ever made are from the Christopher Ross belt collection. Yes Lucinda. Do you think that I’d look best in a cheetah or Merlin? I mean for dress wear.